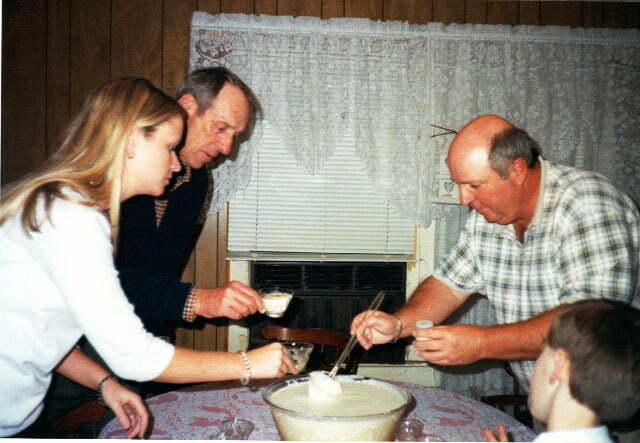 If you have ever been at Windham’s Crossroads on Christmas Eve, then you have surely enjoyed Woodrow’s famous eggnog. 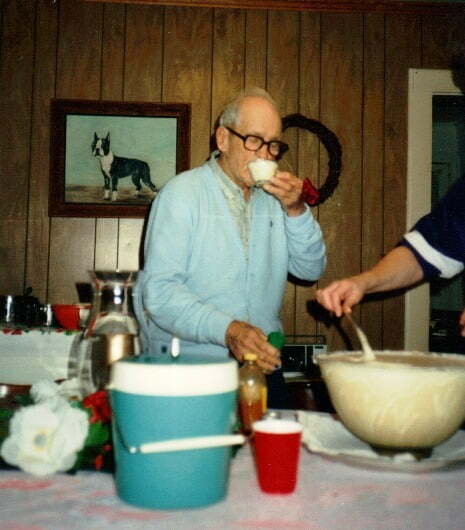 For as long as I can remember, my father, Woodrow Windham, would whip up a huge batch of eggnog. He would invite all his brothers, sisters, cousins, friends, and neighbors to drop in on Christmas Eve for a cup of his super nog. 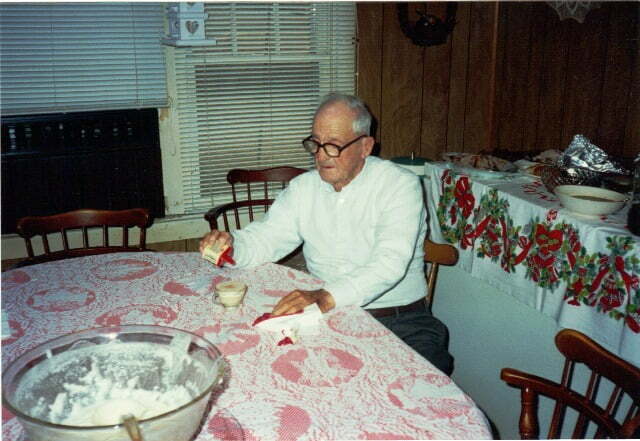 Several years before he passed away, to my surprise, he called me into the kitchen to assist with the secret process. It was important to him to pass the eggnog torch to the next generation. And I was honored to learn the recipe. Without my knowledge, he had done the same thing to my older brother Jim several years earlier. 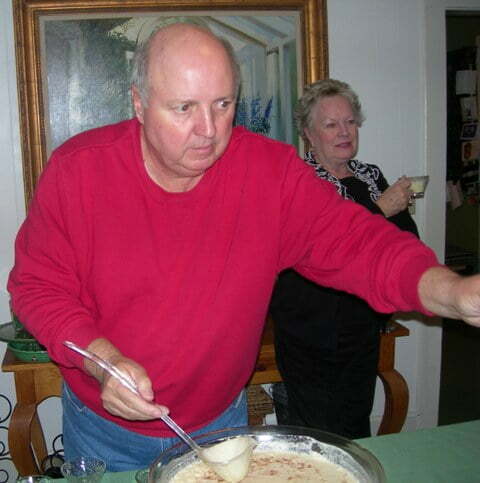 Of course we are going to keep the tradition going, so I’ll be Jim’s assistant in the making of the eggnog. I’m now prepared to share this recipe with you. This recipe completely fills a large punch bowl, so I hope you have lots of friends and relatives. If you have some left over, it keeps well in the refrigerator. The first thing that you will do is separate your eggs into two large mixing bowls. If you have a stand mixer, you can use the bowl of the mixer for your egg whites. This is the most important step in making the eggnog. Do NOT, and I repeat, do NOT, get any of the egg yolks into the whites. It was my mother’s job to separate the eggs while listening to my father constantly saying, “Don’t get any egg yolks in the whites! Don’t get any egg yolks in the whites!” If you do get any yolks into the whites, throw it out and start over. Set the egg whites aside. Using a hand mixer, beat the egg yolks and slowly pour in the 2 cups of bourbon. This is where my father would tell me that the bourbon would cook the eggs. Beat the egg yolks until they are a frothy, golden yellow. Go ahead and put the sugar in and beat some more until the sugar dissolves. 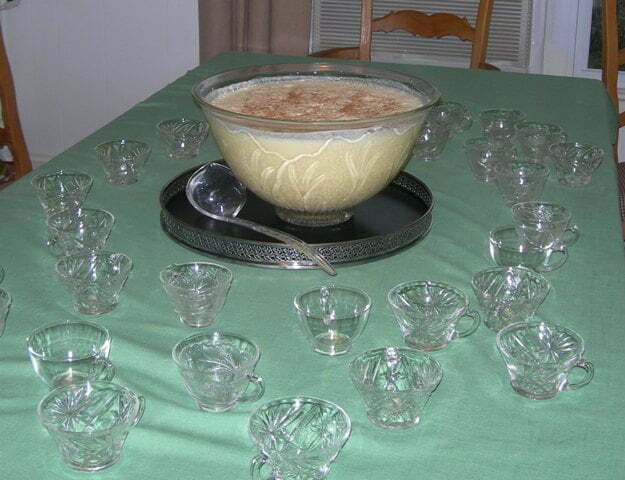 Pour this mixture into the punch bowl and add a half gallon of whole milk and the 2 quarts of prepared eggnog. Use the hand mixer to thoroughly blend all the ingredients. In a separate large bowl, whip your egg whites until soft peaks form. If you only have a hand mixer, be sure to thoroughly wash your beaters before this step. If any speck of yolk remains on your beaters, it will ruin your egg whites. Do yourself a favor and use a stand mixer for this process if you have one. Now it’s time to put the finishing touches on your concoction. Using a spatula, fold in the egg whites into the other mixture. This step takes two people. While one person is folding in the egg whites, the other person is using the hand mixer to slowly blend everything together until it’s smooth and frothy. Generously sprinkle nutmeg on top. When you are ladling the eggnog into cups, be sure to ladle from the bottom to get both the liquid and some froth into each cup. Garnish each cup with a sprinkle of nutmeg. 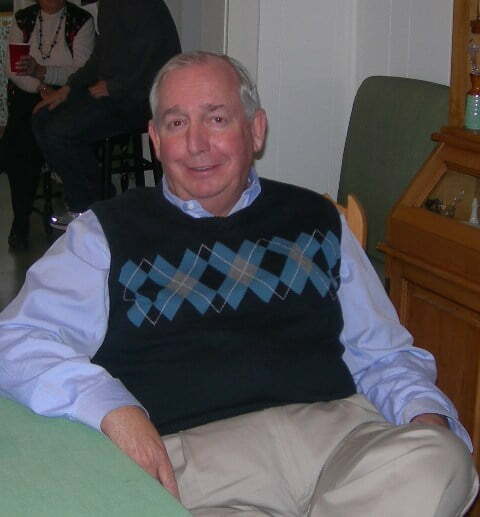 My father always made a toast but since he is no longer with us, the patriarch of our family, my brother Woody (Woodrow Draten Windham, Jr.) does the honor. 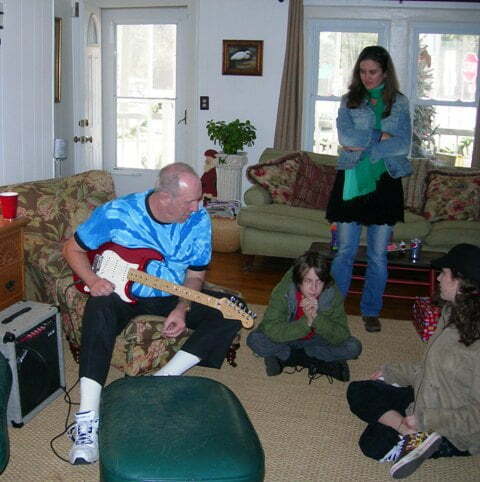 While we’re making the eggnog, Woody usually entertains all the kids with a singalong. This has been a tradition on Christmas Eve at the cottage at the Crossroads for over 50 years. I think Woodrow knew the secret to family harmony, don’t you? You have a lovely family. The recipe sounds like a winner. I think we’ll be adding it to our holiday traditions. Thanks and have a blessed Christmas. I’m featuring your recipe today, thanks again for linking it up at the Heirloom Recipe Party! Thanks for linking up to the Heirloom Recipe Linky Party Jane! I love this eggnog recipe! There can’t be Christmas without it!! 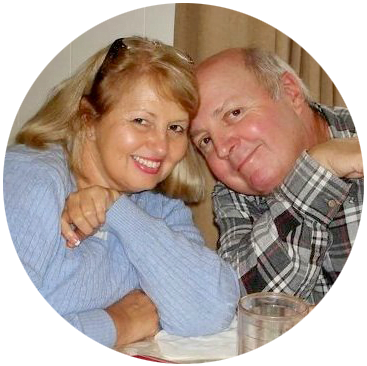 I am featuring you tomorrow in the features post! What a wonderful recipe and wonderful story! I love hearing everyone’s “heirloom” recipe stories, thanks so much for linking up to the party. Merry Christmas Leo and Jane!! I’ve never made eggnog, but this totally looks do-able! 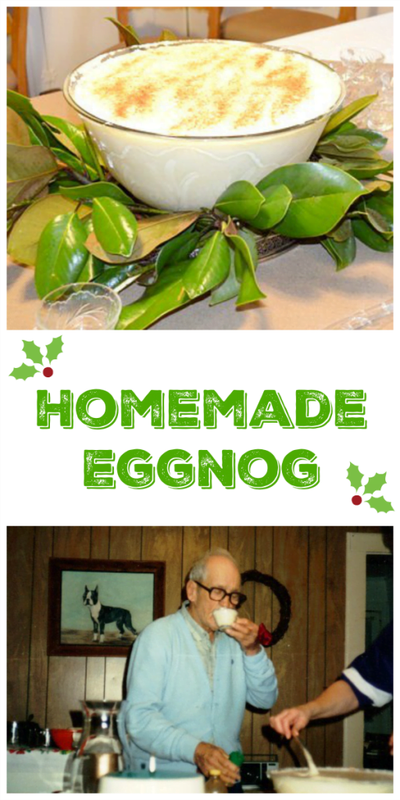 Pinning it now, thanks for linking up to the Holiday Heirloom recipe party! Wonderful recipe and loved the story that went along with it too. I think I’ve really been missing out by drinking store bought eggnog all this time! My daughter always looked forward to a cut of “Christmas milk” each year.. Your recipe sounds wonderful! Hello Jane, this is a wonderful story! I have a few recipes passed down from my parents and grandparents – I look forward to sharing them with my children – keeps the loved ones dear to our hearts. I hope you have a blessed Christmas. Really sweet pictures of your father. We’re not typically eggnog people but I may just have to try some now. What a great tradition. Oh, how I do love egg nog and would love to have a big cup of your dad’s special egg nog. Take care and Have a Merry Christmas. I enjoyed looking at all your pretty decorations, outside and in. You have quite a snowman collection! First of all I want to say how very generous and kind it is that you are sharing this secret family recipe with all of us. It really is a wonderful thing to do, as now your dear father will be a part of many family gatherings across the country! Here’s to you and yours having a very Merry Christmas! I don’t care for eggnog but your post makes it look good so I may have to try it! My hubby’s grandma went into a nursing home a while back and one of the things we got when they cleaned out her house was her liquor cabinet……among the bottles was a bottle 3/4 full of bourbon, so now I can what I can do with some of it! 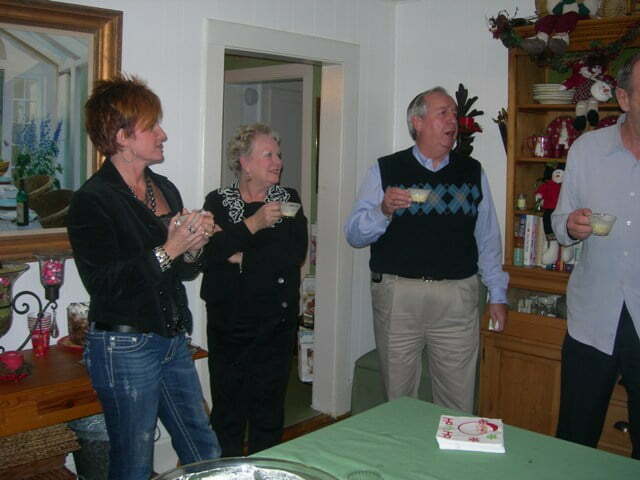 Thanks for sharing the recipe and the glimpse into your family gathering! Sounds like a fun time:) I have never had eggnog. What kind of songs are you all singing? Christmas tunes or something else?